Treat yourself to an autumn retreat and enjoy the beautiful colors of the Great Smoky Mountains at one our small cabins in Gatlinburg. Fall is a perfect time for a romantic trip for two, with bright afternoons during which to enjoy gorgeous panoramas, and cozy cabins in Gatlinburg to enjoy time together after. And, with close proximity to all the attractions in Gatlinburg and Pigeon Forge, there are plenty of activities to make your romantic trip extra special. 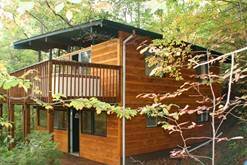 One of the best options among small cabins in Gatlinburg is Mountain Hideaway, a beautiful chalet nestled in a peaceful woodland setting. This charming cabin is a perfect place to take that special someone for some alone time, particularly as you can enjoy the bright fall colors without ever leaving the cabin. The two of you can connect with nature from either of the two spacious porches or use the cabin as your base for outdoor adventures in the national park. You may find it hard to leave your mountain hideaway with so many opportunities to cuddle up together and enjoy the peace and quiet. The wood-panelled interior is warm and inviting and the living room has an electric fireplace with a large sofa on which to curl up together. The bedroom features a king-sized bed and a wide set of windows, with soft lighting to help set the mood. The real highlight of cabins in Gatlinburg for many, however, is the hot tub. Turn on the bubbles and breathe in the crisp mountain air at the end of your day while the water massages away the stress from the daily grind. Soak among the brightly colored forest canopy during daylight hours or watch the stars come out as you spend a romantic evening together. Mountain Hideaway is just off the main road through Gatlinburg, putting you within walking distance of many attractions. The Gatlinburg Trolley keeps you off your feet and provides access to attractions that are further afield, including restaurants, the various Ripley’s locations, theatres, minigolf, and a variety of boutiques and other shops. Gatlinburg is also a perfect base from which to explore the Great Smoky Mountains National Park, the most popular location in the national park system. There are more than 800 miles of trails that bring you up close to nature, including breathtaking panoramas of fall colors or snowy peaks, gushing waterfalls and mountain streams, and historic settler cabins. We also offer exclusive discounts on golf in the area, so ask for our rates before you hit the links. With so much to do nearby, turn your quick getaway into a week-long stay and qualify for a special discount, with 20 percent off any booking of seven nights. Secure your mountain hideaway today!